Perfect base for visiting family over Christmas. Well equipped and very comfy. Have now stayed in summer and winter and cottage works well for both. You can step straight out of the door to lots of beautiful walks. We booked the cottage as the whole family couldn’t fit into the Barn - it is a short walk down the lane and was used for sleeping (the Barn can accommodate more round the table if required). The cottage is an ideal base for a smaller party too with everything you could need for a stay there. A really sensational visit to a stunning part of the world which can easily be overlooked when choosing a holiday destination. Living and working on the Yorkshire Wolds and travelling throughout North Yorkshire I get to see some lovely scenery and feel the views from the Cottage are up there with the very best of them. We have had a great stay and we are looking forward to coming back soon. Fabulous! Clean, very comfortable and well equipped. We were part of the party staying at Marris Barn, which was fabulous too. A perfect location to escape to the beautiful, quiet Lincolnshire Wolds. The house is very comfortable and roomy and well equipped. Very good base for catching up with local family and friends - and good for dogs too! Lovely comfy cottage in the Lincolnshire Wolds. Nice and cosy and wonderful views over open fields and countryside. Landlord and lady very friendly and helpful. My parents, wife and son all enjoyed staying in Marris Cottage on a short family break whilst in the area for a wedding. Nice cosy cottage with good accommodation. 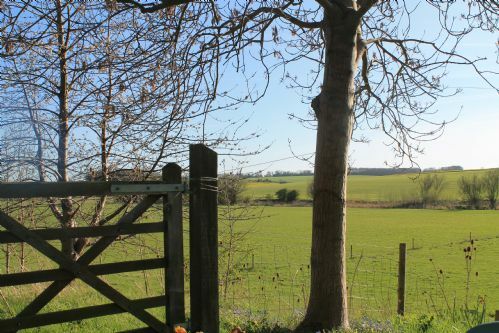 Great location in the Lincolnshire Wolds, so peaceful and super views over open countryside. Lovely, comfortable cottage with wonderful views. Many excellent walks from the cottage. Good pub within walking distance. The cottage is a cosy place that provides you with an excellent base for exploring Lincolnshire. Nice walks, the seaside, Lincoln, Hull are only a little drive away. This was our 6th stay at marris cottage and it did not fail to please. The weather was beautiful and so we were able to enjoy the garden properly for the first time and what a delight it was! It was so peaceful and tranquil, the views are even more spectacular when the sun is shining. A comfortable, warm cottage in a beautiful location with lots of walks from the front door. A welcoming bottle of wine was a nice gesture on our arrival. Very peaceful a welcome retreat from our busy lives. Quaint traditional cottage, in the Lincolnshire countryside. Lovely views from the patio area. Within walking distance of other familiy staying in Maris Barn. Excellent Customer Service from Emma. Only a 20 minute drive from local towns. Fishing organised by James, just a short drive away. Bottle of wine, as a "Welcome" gift was a nice touch. Enjoyable stay had by both couples. We had a great week at Marris Cottage. The cottage itself was cosy and felt like home straight away, there was more than enough space for us and it was handy to have two bathrooms (and an extra WC downstairs!). The one downside was that the cooker could do with updating - the oven particularly was not very effective which meant we spent quite a while waiting for dinner one night! But otherwise we can't fault the place! The garden looked out onto fields and there were some beautiful rural walks from the house and plenty to do just short drives away. We even had weasels playing in the garden just outside the french doors! The price was very reasonable for the quality of the house and the tranquility and beauty of the location. We'd definitely recommend the cottage to others and come again ourselves! The best cottage we stayed in for 10years. It was very easy to find.and really we didn't use the car alot.we walked round every footpath.what a panorama looking around.everything in the cottage wasreally comfortable.the little bedroom looked very inviting too.i would have loved that little room when I was younger.we found everything we wanted and would love to try the other cottages one year.i have walked past the one at anderby creek earlier this year not realising it was a holiday let.it looks really tempting.many thanks from myself and two friends. Very comfortable cottage with lovely views which we thought was excellent value for what we paid. We received very good service from the owners from booking until the end of our stay. I now wish to try one of their other properties especially the one at Anderby creek but it is so popular it will probably be 2018 before we can get in ! This was our fourth visit to Marris Cottage, only this time we bought our son, daughter in law and baby granddaughter along. We all had a fantastic time and will definitely be returning. The cottage is just delightful, with everything you need to feel at home, it's clean, comfortable and in a stunning location. Thank you again. Delightful cottage in a very peaceful, unspoilt area. Superb location for a very quiet, restful stay so we could join our local group's walks at nearby Binbrook, Tealby, Rothwell and Louth. The view from the back across the fields is outstanding and the resident bird life in the garden adds interest - on our last morning we were entertained by a tawny owl in the apple tree being mobbed by numerous smaller birds and a goldcrest apparently challenging its reflection in the kitchen window. The thoughtfully renovated cottage itself is well equipped with a sensible sized fridge/freezer, washer and drier and excellent wifi. The Lincolnshire Wolds is a beautiful, unspoilt area and we hope to return sometime soon. Lovely location, beautiful cottage and very cosy. Despite the chilly weather, especially in the mornings, the cottage was always very warm and inviting. We used this cottage for a short break whilst house hunting in the area. We were welcomed with a bottle of wine, milk, tea and coffee . The cottage was clean, warm and comfortable and is in a very quiet area of the wolds having a small garden and some great views, with horses in the field in front of the cottage which is situated on a very quiet country road.. The working range is great and makes the place really cosy on a cold night. . You do need to take your own smokeless coal along with kindling as there is none. The beds are comfortable and the shower is excellent, although it is slow to get going, as is the hot water in the kitchen. All in all, a really lovely holiday cottage in a lovely location. The only criticism would be that the TV is very small, we found it difficult to watch for any length of time. Lovely cottage in incredibly peaceful location (8 cars and 1 tractor went past in 3 days!) with views over Lincolnshire wolds. The cottage is comfortable and clean with an amazing shower and very comfy bed. We love the area with lots of walks in every direction and good pubs with nice beer and food (the Click 'em and The Ship are particularly good). The owner is very friendly and is kind enough to let us bring our pets with us. It was a very cold weekend when we stayed but the storage heaters had been switched on in advance so the cottage was warm, even though we forgot to bring logs for the fire! However we were able to get some locally, for free! We had a lovely weekend and hope to go back in the spring. Birdwatching from the kitchen door is excellent! I loved my stay in this beautiful cottage. The fire was especially cozy. Would definitely recommend to others. The only thing I would mention is the bathroom off the twin room did not have a shower so we all had to use the one of the double room. Aside from that I cannot fault it. One week away from it all. me, my partner, mum and our little dog. We stayed at the cottage for one week it truly wasn't long enough, we could have stayed alot longer it was home from home without all the stress. The weather had turned it was a bit chilly outside BUT not indoors the heating was fantastic. The beds were so comfortable for all of us the best nights sleep we have had for some time. We made the fire and this was so nice. Only used 2 bags of smokeless fuel for the full week. This you can get in Binbrook. Before we left home i had ordered our shopping to be delivered from asda this was delivered one hour after we arrived i had got a full shop for all of us for the week i would recomend doing this there is a good size fridge freezer so no worries just buy everything you need. I would recommend this cottage to anyone who wants time out. Im sure we will be back. This is our second time at Marris Cottage - it was just as lovely as we remembered, very clean, very comfortable, well equiped and I have no hesitation in recommending this lovely cottage. Marris cottage has everything you need for a pleasant stay. It is very quaint but all the rooms are a good size and the garden is great. The surrounding area is simply stunning and there are places to visit near by. We had a lovely peaceful stay. Great location that was quite and relaxing. Tha cottage had everything we needed for a family with a three year old and a three month old. Would recommend staying there to family and friends. A lovely cottage in the heart of the Wolds, on a very quiet lane....i think we had 2 horse-riders and a tractor go past one day !! The views to the rear of the property were fantastic, and would be great to sit out on the patio area and BBQ on a warmer day. Lots of attractions and places to eat out nearby, with access to Farm walks and numerous other public footpaths in the area. We have previously stayed at Hall Farm's Little Walk Cottage, and we will certainly return in the future, the problem will be choosing which one !! Emma and her team always seem willing to help if you have any queries. A lovely peaceful little cottage away from it all. Firstly I'll start by saying that we were deliberately looking for somewhere very out of the way. And we definitely got it here! The cottage is situated on a tiny narrow lane. I can't stress how narrow the road is; you'll turn into it and think "I've got to take my car down there?!". I should state that I drive a 7 seater that's wider than the average car and I could get it down the road, and parked up easily so it's absolutely fine, and definitely worth it for the stunning views over open countryside. A car is absolutely essential here, as is good organisational skills. There is a pub that serves food a mile away, which is a pleasant walk, however it was not open until 5pm for most of the week so before you take a stroll around to it, check their opening times (may be different in summer?) There is a small village of Binbrook 3 miles away which does have a couple of general store type shops but, frankly we found them really very basic, not terribly friendly and quite expensive. My thoughts were that if you have to drive to go to a shop, you may as well go a bit further into Market Rasen, have a look around the nice little shops there and get what you need in the supermarket. Tesco's apparently delivers to the cottage (we didn't use them though). All that said, a short stroll down the lane and we found an old phone box that was being used to dish out free potatoes! When we arrived there was a nice welcome pack - milk, a bottle of wine and the usual tea coffee and sugar (if you've never stayed in cottages before it's worth stating that previous occupants usually leave behind some supplies so you may find quantities vary and there might be other things left for you too). The cottage itself is comfortable, with large living/dining room with a large comfy sofa and armchair and a nice range fireplace (the fireplace can be used but it's not a working range although we did manage to prove a lovely loaf of bread or three in what was the old oven). The kitchen is small and quite basic but good enough for our needs. The two bedrooms are a good size, with plenty of storage and both having en-suites (one a bath, the other a shower). In the double bedroom there is a small cot room - we didn't need this but the room itself came is quite handy for storing out cases in. The cottage is equipped with night storage heaters; if you are going in colder months and have never used these before, I strongly advise you to read up about them first so you know how they work and can control them. The owners had very thoughtfully put them on for us so we have a lovely warm first night. Hot water is on an immersion boiler and there was always plenty for the 4 of us. Other facilities like a hair dryer, ironing board and iron, vacuum cleaner etc. are available, as well as a cot and high chair if needed. There's a couple of radios, CD player, selection of books, playing cards and games and a TV/DVD player of which we found the screen rather small! Wi Fi access is good considering the remote location. The only con I can think of is the parking which is on the grass verge opposite the cottage. I was quite wary parking a 2 ton vehicle on a muddy grass verge (and risk getting stuck) but as it happened that was ok as the ground underneath was quite firm. However you then need to cross over a grass verge on the other side to get into the cottage. I'm sure that in fine, dry weather this isn't an issue but for us - at the tail end of winter when it was quite wet - we got quite muddy doing so. I would advise wellies! In summary this was a really pleasant, comfortable cottage in a lovely location. Perfect for walks and a peaceful country getaway. Thank you very much again for the brilliant stay we had in your cottage! We have felt at home from the very 1st moment and the stunning location (even in the winter) only adds to this perfect impression! We can only recommend this nice cottage! My wife and I along with my brother and his wife stayed at Marris Cottage for 3 nights. When we arrived we were delighted to find everything we needed already there, even down to fresh milk, tea and coffee for our arrival. Everything was spotless. We were very comfortable, the beds especially so. The rest of our family stayed in the Barn with a fantastic array of facilities which they shared with us. All in all we had a brilliant time. lovely weekend at marris cottage. great weekend away at marris cottage, all home comforts and fantastic views. Would definetly recomend this cottage for a holiday. the owner was very helpful and would definetly return again. Everything was just great for a short stay away from the busy South of use gland and for visiting family. The cottage was very cosy and inviting and having an open fire was the icing on the cake. thanks to Emma and her team for making our stay so special. A wonderful third stay at Marris Cottage.- a real home from home in the delightful Lincolnshire Wolds in the month of September during harvest time. The charm, peace and quiet of the cottage, surpasses all that I have stayed in during recent years, it is clean and spotless and all that you need is provided for. It's hosts Emma and James are just lovely people who are there to make your stay most enjoyable. The surrounding countryside is just beautiful whilst being wooed to sleep by calling tawny owls and woken by cooing wood pigeons what more could you want for? A wonderfully peaceful cottage with fantastic views over farmland (and dog friendly!). Seamless booking and excellent customer service, thank you Emma! A thoughtful conversion of this lovely old cottage has made it an excellent holiday home - an example is that both bedrooms have full en-suite facilities at opposite ends of the building, so there is no disturbance to the other occupants. Set by a very minor road with unbelievably little traffic, with wonderful views over the surrounding farmland, it was a haven for lovers of wildlife - one day a stoat popped out of the bank just feet from the window! The cottage was well fitted out, with very adequate crockery, cutlery and cooking utensils in the kitchen, and the bedrooms, though small, were well furnished. The Lincolnshire Wolds all around are incredibly quiet and beautiful, yet Cleethorpes/Grimsby and the coast are only a short drive away in one direction; the beautiful cathedral city of Lincoln is little over half an hour away in the other direction. Marris Cottage is in a shaded location with a view in the height of summer over sunlit fields of corn. That it remains n the shade means it is a cool place to return to after a day in the sun. Delightful and cosy and perfect for a reclusive away-from-it-all stay. Peace and quiet, open fire, comfy beds, very doggie friendly, great showers and a bath , fab walks, small enough for 1 and big enough for 5. Love it. Beautiful place all mod cons you could want. Peaceful secluded and totally recharged. Access to cottage is easily found with quick links to Cleethorpes just a short drive away. As Arnie would say " I'll be back"
5 star accomadation lovely views comfy bed this cosy clean cottage is perfect quite break we needed.hope to pay yet another vist later in the year . Loved the old range, comfy beds, complete silence at night ( apart from owl hooting ) really useful to have two bathrooms and a downstairs loo.great to be so close to everywhere but far enough out to relax. Another wonderful stay at Marris Cottage. Having been in autumn and Spring, I now need to try it out in Summer also. Everything that one could possibly want is provided and the cottage is delightful. The beds are wonderfully comfortable also. The shower room and kitchen walls are however looking a little bit tired and could do with being freshed up a little.